The ‘Dum Maro Dum’ singer, Asha Bhosle, who sang more songs than her great sister, Lata Mangeshkar, and more than even Rafi, is celebrating her 84th birthday on September 8. Behind this accomplishment there is obviously a tremendous sadhana, ego-transcending practice, that too, with devotion, for she, unlike her great sister Lata who is known to sing in high registry, is known to sing in lower register, which many people took literally, while the fact remains that lower notes are as difficult to achieve as higher notes. In this endeavor, as Raju Bharatan, author of Asha Bhosle: A Musical Biography observed, OP Nayyar played a commendable role: he not only “made her believe that she has a very strong low register”, which is unique by itself but also offered her a platform to develop a distinct style of her own, a very different one from her already well-established sister by composing songs in lower register for her to render pretty impressively. For instance, he composed the song, Aiye meherbaan, baithiye jaane jaan/ Shauk se liijiye ji ishq ka imthihaan …come my beloved, sit down my darling/Then, if you please indulge yourself by taking love’s test… (‘Howrah Bridge’, 1958) in low register, which Asha sang with all those finer nuances, those inflections, ornamentations and vibrato to the accompaniment of the rhythm of castanets and of course, adding all that heavy lifting in the seduction area with her sensuous voice that made the song remain popular even to date. This OP-Asha combination that started with that feisty and folksy song, Uden jab jab zulfein teri / kavariyon ka dil machle (whenever your hair starts flying, the hearts of the damsels fly) from ‘Naya Daur’ (1957), ran for almost 17 years during the course of which they gave many popular songs such as: Jaiye aap kahan jayenge, ye nazar laut ke phir aayegi…(Go wherever you wish to…) from ‘Mere Sanam’ that was composed again in low registry based on raga Piloo, which Asha crooned so breezily; Ishaaron ishaaron mein from ‘Kashmir ki Kali’, a duet that was sung so playfully with Rafi portraying such an intimacy listening to which gives a feel of eavesdropping in on a conversation; Haule, haule chalo more sajana from ‘Sawan ki Ghata’, etc. However, this combination had finally terminated with that slow but haunting song, Chain se hum ko kabhi aapne jeene na deeya from ‘Pran Jaye Par Vachan Na Jaye’ (1974) that she sang so poignantly mixing passion as well as pain that won her a Filmfare award, which she, of course, refused to accept. As many credited Nayyar with helping Asha in creating an identity of all her own, during this period Asha, as she herself observed once, could cultivate a voice and style of her own—a carefree and fanciful style within her low registry—that is distinctly different from her sister Lata and thus could carve a niche for herself in the Hindi music world. Taking advantage of her magical voice, SD Burman too rendered quite a few hits with Asha such as Deewana mastana hua dil jaane kahan (‘Bambai ka Babu’, 1960), in raag khammaj, which starts with Asha’s haunting call with sargam notes, aaaa aa aa / Pa ma ga ma re ga pa ma ga ma, aaaa aa… / Saa nii dha pa ma ga r saa nii nii nii… / Diivaanaa, mastaanaa, huaa dil, / jaane kahaa hoke bahaar aaii… in a voice swung in “masti” that well creates an extremely pleasant effect, listening to which the listeners could not help but smile and hum along. In a roothna-manaana kind of duet from Kala Pani, Asha sang Acchaji main haari, chalo maan jao na (Alright, I admit defeat, please don’t be mad at me anymore) in a frothy, fast and naughty style which delights the listener while enabling the heroine to cheer up a sulking hero and finally both making playful faces. During the late 1950s, when Burmanda had a tiff with Lata, he offered Asha solo songs too. One such memorable song is, Kaali ghata chhayi mora jiya tarsaye (The sky is grey / I am longing for you) from ‘Sujata’, in which Asha pours her heart out to express the melancholic yearning of the heroine—a sweet crooning. As many critics observe, Asha sounds quite exotic and fresh and alluring under Burmanda’s baton; for instance, the song, Raat Akelii hai, bujh gaye diye (the night is lonely, and the lights have gone out) from ‘Jewel Thief’. Burmanda, who is known to pick the right voice for his songs, picked Asha for singing this song, which Asha rendered amazingly: the way her voice flows seductively through low notes and then surges out through very high notes landing in a joyful crescendo before tapering off into a whisper again, effortlessly hitting the highest of highs and striking a sultry laugh beneath the lows, Asha simply mesmerizes listeners. And what an incredulous breath control! Incidentally, the heart-wrenching song Ab ke baras bhej bhaiyyaa ko babul, Sawan mein lijo bulaay re (O father, do send my brother this year to fetch me during monsoon)—which I believe she sang so impressively to perfection the lyrics penned by Shailendra that are throbbing with sentiment under the tutelage of SD Burman in the film, ‘Bandini’. She sang this song taking the lyrics to the heart… portraying the emotions of a young woman who longing for her natal home and babul ka pyar that she left behind and pinning for her brother to come and fetch her home so expressively: notice the gentle vibratos; the drawling of the words, ‘bulyare’ , bhiyaay re bhijaay re and ‘yad ayere’ , albeit softly as though to show how yearning the woman is; in the line chalke nayan mora kaske re jiyra, feel the abrupt enunciation of ‘chalke’ in contrast to the wringing the word, ‘kaske’, perhaps, to make us feel the squeeze of the heart; the lovely transitions from one phrase to the other, all in low registry… and importantly, least disturbed by any percussion instrument … yet pouring out the grief of the craving of a young woman for her bhaiyaa to come and take her to babul’s home so expressively in her soft voice … all this makes it a brilliant presentation of a girl’s angst at her becoming a parayii, an alienated one, to her own father who indeed brought her up so tenderly … What a dear delight to listen! No wonder if Pundits opine that this song consolidated Asha’s position as a lead singer in the Hindi film world. Moving on to music director, Ravi, Asha gave one of her best renditions: Aage bhii jaane na tu, piiche bhii jaane na tu (you may not know what lies ahead of you, nor do you know what lies behind you)/ jo bhi hai bas yahii ek pal hai (what is here now is only this very moment) … jeenevaale, soch le yahii waqt hai kar le purii aarzuu (O living soul, think fast: this is the time to fulfil all your desires)…—that inimitable brilliance of Sahir Ludhianvi’s poetry which was set to an exquisite tune by Ravi was sung by Asha Bhosle for the film ‘Waqt’ so passionately, passing through those undulations as sweet strumming of guitar and sax accompanied her creating a romantic effect, she could well delineate Ludhianvi’s underlying philosophical statement about life. This is one of Asha’s most haunting melodious hits. There is yet another beautiful song penned by the same Sahir Ludhianvi and music composed by Ravi based on the raga, Darbari in the film, ‘Kaajal’— tora man darpan kehalaaye (Your mind is said to be the mirror)/bhale bure saare karmon ko dekhe aur dikhaaye (deeds good and bad, it watches and shows all! 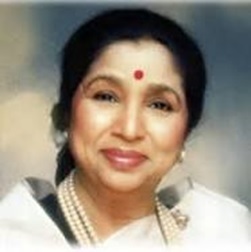 )/… man hee devataa, man hee eeshwar / man se badaa naa koee (mind is celestial, mind is God / None there is greater than mind)…, which Asha Bhosle sang so elegantly, undulating between lower and higher notes so devotedly that often tempted listeners to wonder if it was sung by Lata. Singing it so devotedly to the accompaniment of sweet strokes of Sitar and Santoor, she made it an immortal bhajan. Come the 1970s, with the arrival of RD Burman, the music wizard, on the scene, Asha enjoyed full scope to explore her versatility by singing different genres as diverse as cabaret, rock, disco, ghazals and even classical. It is RD Burman who made her singing sound more youthful with his creative tunes— foot tapping, heart-pounding, and even endearing melodies such as, O haseena zulfon wali and Sona re sona (‘Teesri Manzil’). Indeed, these two together delivered many frothy, fun-filled, and rhythm-oriented songs. As it’s hard to imagine a Helen dance number without the delightful and sensuous voice of Asha, who can forget to pick that catchy and evocative song Piya tu ab to aaja from ‘Carvan’ (1971) sung by Asha that so well sailed with the steamy Helen cabaret dance. This youthful song also fetched her Filmfare award for 'best playback singer'. The following year came that hippie anthem-like song, Dum maro dum, a magnetic rendition, overflowing with lots of energy from ‘Hare Rama Hare Krishna’ (1972). This cult number fetched her Filmfare award for 'best playback singer'. Then came the all-time romantic song, Chura liyaa hai tumne (‘Yaadon ki Baaraat’, 1973). It is still fresh in the minds of listeners for its youthfulness and the way the lyrics were whispered by Asha as though to highlight the underlying longing duly accompanied by the melodious sequence of single notes played one after another on guitar. Interestingly, the prelude of the song starts with clinking-of-a-glass-with-spoon groove followed by guitar with a slow upstroke on a single chord reproducing the romantic atmosphere of a club and as it is advancing, violin joins in slow phrases and as it tapers off, Asha whispers longingly— Chura liyaa hai tumne jo dil ko, najar nahee churanaa sanam / Badalke meree tum jindagaanee, kahee badal naa jaana sanam — and as she comes to the next line — Oh le liya dil oh hai meraa dil, hai dil lekar mujhako naa behlaana— she drawls the words le liya dil and meraa dil so tantalizingly that it pleases the ear pretty romantically…and the interlude of trumpet followed by violin phrases and strumming of guitar adds beauty to the song… and finally as Rafi joins with his silky and smooth voice the composition takes us to the peak of pleasure… It’s often commented that this song resembles a western tune—of Bojoura, “If it’s Tuesday this must be Belgium”—but Asha and RD have indeed transformed the original into an awesome Hindi song! Come 1982, when Khayyam invited Asha for working in the film, ‘Umrao Jaan’, she was already 35 years old in singing for Hindi films. And obviously, Khayyam’s ambition to ensure that Asha would be Lata’s ghazal-singing equal, had become a mere straight job—a job of leveraging on her well-established strengths: one, “very strong and smooth low register”, two, “very long breath” and three, “her bass voice”. And that’s what he did: he composed all the ghazals supposed to be sung by Asha at a lower octave than her usual. And the rest is history: Asha herself was surprised that she could sing so differently. She sang all those ghazals so well that for a layman it is difficult to rank them. But connoisseurs consider the song, Aa aa aa aa, aa aa aa / Dil cheez kya hai aap meri jaan lijiye / Bas ek bar mera kaha / bas ek bar mera kaha maan lijiyee … (what is the heart worth? take my life / just one time, what I say / just one time , heed what I say…), as her best. For, notice how imploringly she renders the words, bas ek bar mera kaha maan lijiyee—simply mind blowing. It is the spirited poetry of Shahryar which aptly portrayed the romantic faith of the girl: kahiye to aasmaan zameen par utarlaayen (If you say so, I will bring the sky down to the ground) …. Mushkil nahin hai kuch bhi agar thaan lijiye (Nothing is difficult if you firmly pursue it), and the emotions that these words evoke were so well translated into the rendition of the song, that too, in a very melodious voice by Asha. And, of course, Rekha’s presence on the screen only made this mujra more beautiful. It is not for nothing that Asha was presented a National Award for the best female playback singer for singing the ghazal. Equally stunning was the other mujra in which Asha’s ravishing voice croons, In aankhon ki masti, mastaane hazaaaron hai (the power and nasha of these enchanting eyes, many are its admirers), which is just sumptuous. The character of Umrao Jaan is full of pain and loneliness and it is well portrayed by Asha in the rendition of yet another song, Yeh kya Jagah hai doston, yeh kaunsa dayaar hai (What place is this, friends? What kind of world is this? )… Na bas khushii pe hai jahaan, na gham pe ikhtiyaar hai … (in this place neither I have control over my happiness, nor is there any choice in my sorrow). Its very prelude on Sarangi throbs the heart so heavily that one could well foresee what anguish is in the offing. The tune and its rendition are so very haunting, for the words are so wrung by Asha to let the listener perceive the sense of loss and confusion being suffered by the heroine, which indeed made many consider this song as the gem of the movie. To sum up, Asha’s singing of these ghazals that have soulful quality had simply put her on a high pedestal. As a natural sequence to this, then came Gulzar in the late 1980s with unique lyrics to that magical composer RD Burman to compose a tune around them for his movie ‘Ijajat’. However, those beautiful, but non-rhyming lines didn’t excite RD. But an impromptu rendition of those lines by Asha was said to have ignited RD’s creativity and the result is there for everyone to enjoy. It is perhaps one of the most haunting renditions: Asha renders the lines— Mera kuchh saman tumhare pas pada hai (some of my things are still lying with you) / O o o … savan ke kuchh bhige bhige din rakhe hain (some drenched monsoon days) / aur meri ik khat mai lipatee rat padee hai (and a night wrapped in one of my letters) / wo rat bhujha do, mera who saman lauta do (extinguish that night, and send those things back to me) / … / ek ijajat de do bas, jab inko dafanaungee (Just grant me this wish, that when I bury these things) / mai bhee vahee so jaungee (I will also go to sleep…. there)—so slowly and softly but in an intensely moving voice that seeks to evocate the underlying urge of those words to recall the past into the present and the present that they long to bury once for all so intensely, for the music director least interfered with the vocals by choosing soft interludes of santoor that so delicately slides from one note to the other, that the listeners are sure to get carried away to a distant world. And, Asha pocketed her second National Award for best female playback singer for this song. As time moved forward, this 62-year-old veteran playback singer, Asha Bhosle, returned to sing two super hit songs in the 90s —Yai re yai re jor lagake naache re (Hey! Make an effort and dance) / yai re yai re milke dhoom machaaye re (together we’ll create ruckus) and Tanha, tanha… —for the movie ‘Rangeela’ proving that “age cannot wither her”, nor times can stale her infinite versatility.